You have heard about Twitter. 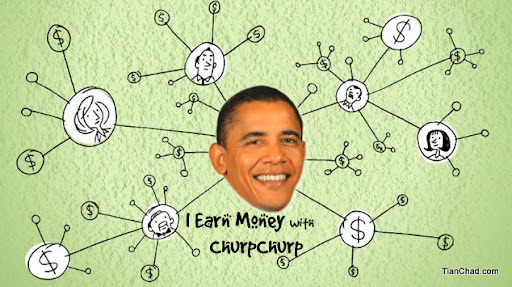 What bout you can make money online by just twitting for ChurpChurp? 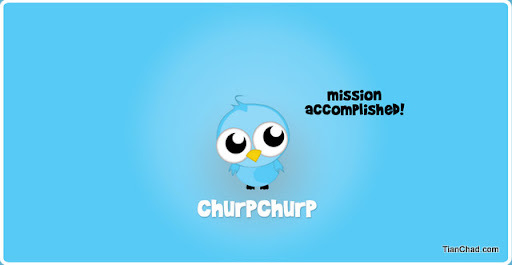 ChurpChurp is an advertising network for Twitter. The advertisers will specify the tweet contents to be propagated, also referred to as a Churp, so when you sign up and allow us to post Churps among your tweets, you earn money! The advertiser will come and find ChurpChurp for twitting about their latest news, promotion or even event for you to join. ChurpChurp can help in targeting different level of audiences base on gender or age. 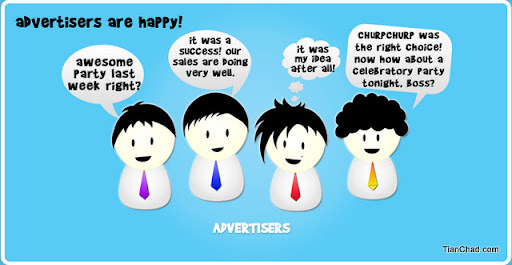 If the advertiser have special targeting requirement they can contact them here. So, once ChurpChurp receive the requirement from the advertiser, they will start looking for suitable audience to twitt about it. The Twitterers such as me can choose to churp [means twitt] or not. Once the twitterer churp about the message to be bring out. The churp will need to get through administrator's permission before it was allowed to be released. How much do we Twitterers earn? Earnings credited to your ChurpChurp account varies depending on the number of followers you have, how many times you Churp and also the type of ads that you get. Basically you will get a generated tweet posted on your Twitter according to your Twitter content. These tweets will be listed out for you in advance, so you may choose to approve or reject them. If no decision is made within a certain time frame, however, the tweet will go out automatically. You will be notified via e-mail of a new campaign and given a brief to compose your Twitter posts in any way you want. These Churps will earn you more than automated Churps so get creative! Do note that your written churps may be subject to a vetting process, which means your earnings may be delayed. After 5 successful churps, they'll "pre-approve" your account so that your earnings get credited faster (ChurpChurp reserve the right to reinstate the vetting process on your account if the need arises). If you are a Twitterer, I am sure you know the viral effects of Twitter right? Once the message that was spread is interesting enough it will attract other Twitterers to twitt about it to their friends and followers. Nice thing will always be shared. 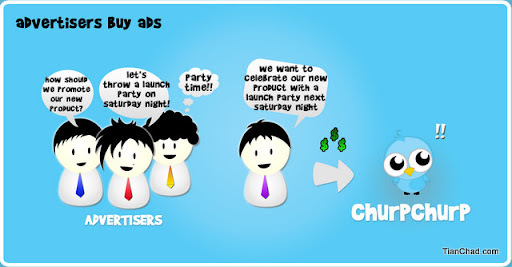 The benefits of using ChurpChurp advertising network is good for both the advertiser and the audience. The message will be successfully bring to their targeted audience while the twitterers will able to earn money by just twitting. Win-win situation! So, that is how ChurpChurp work. 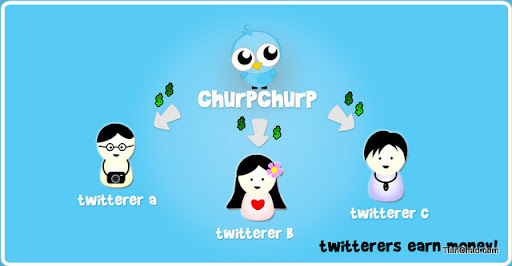 For now, ChurpChurp is open for registration for Twitterers from Malaysia and Singapore only. Below is my accumulated earning by just churping and twitting. Remember, the amount that you earn is depends on how many followers you have, how many times you churp and what types of ads you get. I am now having 350++ followers on twitter, what if the person with 1000++ followers? He will surely earn more than me! You need to get at least RM100 /SG100 before you are able to cash out. The payment will be processed 30 days after the end of the month when you cashed out. 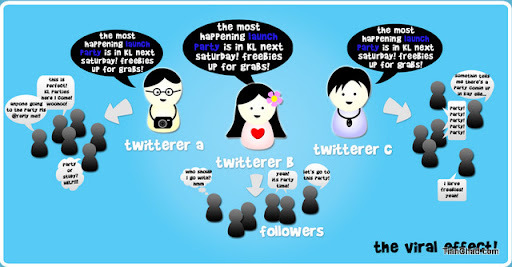 Besides twitting and earn money, you will also able to enjoy free premiere screening exclusively for Churpers~! Here is how I manage to watch the premiere of When In Rome. Thanks again! Tips: To win FREE movie tickets from ChurpChurp, do follow @Churp2 on twitter and their blog. Do follow me (@TianChad) on Twitter. In future I will share more tips on how to earn some extra pocket money through blogging and many more! Cheers! 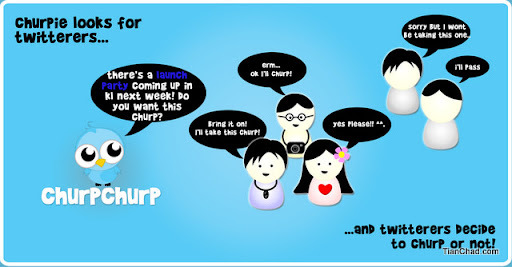 It’s ChurpChurp 1st anniversary and they are rewarding Churpers with RM3,000 worth of instant credit just by inviting friends to join or just by simply joining the ChurpChurp community! Thanks for the introduction. Just joined. Proud to say that i'm a Churper! Heh. Have u try other Twitter Advertising network like Magpie or Sponsored Tweet? They'll pay in dollar thru Paypal.